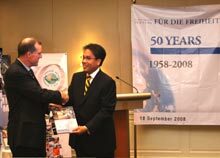 Dr. Mark Mullins, executive director of the Fraser Institute, receives the first copy of the EFW 2008 Philippine edition from Sen. MAR Roxas. To highlight the Economic Freedom Network (EFN) Asia’s Manila conference on property rights, the Friedrich Naumann Foundation for Liberty (FNF), the Center for Research and Communication, the Philippine Economic Society and the Foundation for Economic Freedom launched the Philippine edition of the Economic Freedom of the World: 2008 Report (EFW) in Mandaluyong City on 18 September 2008. Compiled by a global network of think tanks led by the Fraser Institute, the EFW constructs a statistical index of economic freedom worldwide. It has five components: size of government, legal structure, access to sound money, freedom to trade internationally and regulation of business, labor and capital. It looks at correlations between the degrees of economic freedom on the one hand and development objectives on the other hand, and it tracks these changes over time. This is to test empirically whether economic freedom is associated with growing prosperity and social development or not. The current issue focuses on economic freedom and poverty. It shows that as the world has become freer, poverty has been reduced. It is striking to note that the poorest countries all are marked by a grievous lack of economic freedom. Countries that increased economic freedom saw poverty rates decline. Dr. Mahar Mangahas, president of Social Weather Stations, and Atty. Butch Abad, former Deparment of Education Secretary, discuss the EFW 2008 Philippine edition. “One of the adages of business management is if one cannot measure something then one cannot manage and so therefore improve it. Thus the impact of economic freedom on the lives of Filipinos, which used to be unclear, is now made much clearer with the launch of this year’s Philippine edition,” said Senator Manual “MAR” Roxas II, Liberal Party president. “Sadly in our country, it is our ungainly laws and the inefficiency of our legal structure that restrains us from improving our lives,” he continued. “The EFW cannot resolve the challenge for us. It can merely inform us and warn us that the need for better balance and better governance exists. This is a valuable tool for us to assess the level of economic freedom in our country and use that knowledge to bring forth our nation’s great destiny,” he concluded. 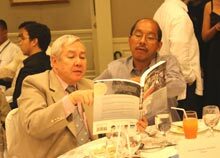 The launch of the Philippine edition of the EFW 2008 report was also the focal point of the joint celebration of the Foundation’s 50th anniversary and the EFN Asia’s 10th anniversary on 18 September. The dual event emphasized their continued partnership in safeguarding individual liberty through the free market economy. Together, FNF and EFN Asia further develop the use of the economic freedom index in Asia as a tool for policy debate and analyze the region’s economic developments.